We’d love your help. Let us know what’s wrong with this preview of Garvey's Choice by Nikki Grimes. To ask other readers questions about Garvey's Choice, please sign up. What is the setting of Garvey's Choice? Jack Q suburbia I'm guessing? People of ALL ages should read this! This book says so much. It's written in tanka poetry form, but tells a story of a boy who's overweight and has a father who wants him to be a jock. It's a wonderful read for kids and sends an important message. My daughter enjoyed it too. Stars wink, words slap, and laughter spatters in the pages and poems of Garvey’s Choice by Nikki Grimes. This beautiful story is told in verse with emotion and force. A story about a boy finding his way at home, school, and life. starting to like what I see. This little book caught me off guard! I don’t even know how it happened. The poems start out simple and funny, but the emotions build and build. And all of a sudden I’ve got tears in my eyes over a father and son discovering a way to connect and talk. 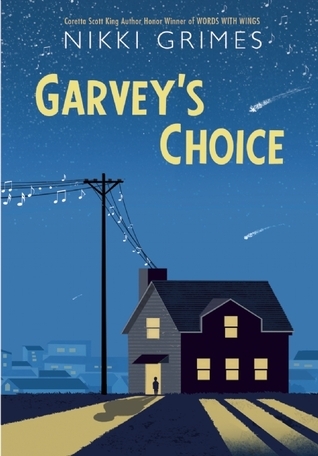 Garvey’s Choice is a treasure for readers filled with strong messages about identity, self-respect, family, and friends. Plus it has music in the words! I love when music plays a part in someone finding their voice and way in the world. I think I liked this book because me and Garvey are similar in the fact that we may not be the thinnest, but when the world makes fun of you for it, we both went to music and friends for our safe haven. This sweet lyrical book is a quick read, but is packed full of emotion and life lessons. Nikki Grimes masterfully tackles identity, family relationships, body image and healthy weight loss, friendship, and self love all in a book that you can easily read in less than an hour. I will definitely be purchasing this for the classroom library. Loved it. I choose what words to let in." That is strength. And that is Garvey's choice. Amazing book written in Tanka form poetry. I foresee this as a powerful read for any adolescent. This book gives voice to what many young men fear, not living up to the expectations/vision of their father. I just love how this book gives voice to issues from a male adolescent perspective. For me this book was an amazing "window" and hopefully Amazing book written in Tanka form poetry. I foresee this as a powerful read for any adolescent. This book gives voice to what many young men fear, not living up to the expectations/vision of their father. For me this book was an amazing "window" and hopefully a doorway as I am raising a son. It is a great reminder for me to always listen to what he is interested in, and don't fall into the feeling or pressure for him to conform to what societal pressures we may feel. I really liked the character development in this book. Garvey goes from a shy kid to a kid who isn't scarred to sing. I do, however, wish the book was a little longer. I thoroughly enjoyed this novel about a boy coming to terms with who he is. I love the explanation about the poetic form used. Short and in my opinion, a couple mistakes in grammar. It was cute, but not my favorite. Garvey is a boy who love reading and Star Trek. His dad on the other hand, wants him to be athletic, love football and sports. Garvey's mom follows his path with him. This book really explained the pressures on Garvey, his dad, football, and school. I gave this book 3 stars because it was slow throughout the beginning of the book to the end. I would recommend this book to those who enjoy realistic fiction. A sweet, beautiful story in verse. I love Nikki Grimes' books - such a talented poet. The book has several important messages about life. What Garvey wants most is a way to connect and escape the isolation he feels from others his age and from his own family--well, from his dad. This probably sounds all-too-familiar, which is why I feel this verse novel could be an excellent tool for reluctant readers. The language is simple and the story moves lightning-quick. Furthermore, this could be a remarkable opportunity to introduce readers to poetry different from the "strictly classics" content included in many school curricula. Most si What Garvey wants most is a way to connect and escape the isolation he feels from others his age and from his own family--well, from his dad. Every time I read a novel in verse that I really enjoy, I wonder why I don't read more. This is a very sparse book, but it manages to pack a lot in. Garvey and his dad just don't connect. Garvey is an intellectual, his dad wants him to be an athlete. Garvey is also overweight, and struggles with name-calling. With the help of some friends, he finds a way to shine. Really good, its sweet and short. I like the style this book was written in. The short poems showed you enough to understand what was happening. Each page was like information concentrate, while short the packed a punch. This book was good and I liked the concert part towards the end. Definitely a must read, and undoubtedly a short read. Overall a pretty good book. A super quick read that is packed full of emotion and life lessons. Garvey is on a journey of self discovery and I loved every minute of it. Nikki Grimes is amazing! Written in Tanka it is a joy to read. Great lessons for middle school students and a quick read. “...Legend has it that Luther Vandross, the wonderfully soulful R&B singer, created the original sandwich. That might explain some of his health problems that included diabetes and high blood pressure, both linked to bad diet and being overweight. Vandross died in 2005, at the young age of 54, of a heart attack. I knew his music, his name. makes me want to punch a wall. He shouldn’t have died at all. up and down, losing, gaining. His heart just couldn’t take it. slow so I can stick around. An engaging verse novel for middle grade readers employing the tanka poetic format, GARVEY’S CHOICE features an overweight boy who seeks to discover his own voice as he struggles with body issues and his father’s disapproval. Garvey is named for black nationalist Marcus Garvey. He’s into reading, astronomy, and chess, activities that don’t involve a lot of running and coordination. He fears that his sports-loving father sees him as an alien. He’s picked on at school for being overweight. His best friend is Joe. We were our own melody. for a laugh. But we didn’t. That’s how we knew we’d be friends. Thanks to Joe and another good friend, Garvey finds the confidence to try out for concert choir, and his success with singing helps him strive toward healthier management of his weight problem. GARVEY’S CHOICE is a feel-good story. Garvey’s newfound talent leads to healthy self-confidence and an improved personal relationship with his father. This is an important story because of Garvey’s weight problem. For years, experts in public health have warned that the U.S. is suffering catastrophic health crises due to widespread obesity and the related epidemic of Type II diabetes. Diets that include too much soda, junk food, and processed food combine with sedentary lifestyles. The result, according to the CDC, is that one in three American children and adolescents are overweight or obese, and over one-third of American adults are obese and at risk of dying prematurely. Therefore, it’s great to see this issue as part of the story. For some, GARVEY’S CHOICE will be a quick and easy read. It’s approachable, short, and there is a lot of white space. For others, those who enjoy a memorable turn-of-phrase and who like to poke around in the stitching and see how an author weaves words into a poetic pattern, this is a tasty treat to savor. This is written in an ancient poetry form called Tanka that originates in Japan. That isn't easy to pull off and she does so effortlessly. The story is about Garvey who is a young man in high school that is trying to find his place. He has a strained relationship with his father who values athleticism over Garvey's love of reading and This is written in an ancient poetry form called Tanka that originates in Japan. The story is about Garvey who is a young man in high school that is trying to find his place. He has a strained relationship with his father who values athleticism over Garvey's love of reading and looking at the stars. As Garvey gets older, he finds solace in food and this becomes the cause of him being overweight and the object of derision. Garvey begins to find a safe place when he decides to join choir. This also becomes a bridge to building common ground with his father. This is an easy read, but I felt pulled in a lot of directions. The initial focus seems to be Garvey's love of chess and his interest in books and outer space, but then that takes a back seat to the weight issues he has and whether he would like to join choir. Loved this verse novel about a father's expectations and his son's desire to be himself. "Smile showing up like hope till ugly whispers from last year echo in memory, scraping that smile from my lips." Writing a book all in verse must be the hardest way to write a book. You not only have to make your work stand out, but you must grasp the reader in a lot fewer words. This one comes with a heavy topic. The words bleed and cry with the turn of each chaptering page. Garvey is overweight and kind of nerdy. With one friend who encourages him in everything he does "Smile showing up like hope till ugly whispers from last year echo in memory, scraping that smile from my lips." Garvey is overweight and kind of nerdy. With one friend who encourages him in everything he does, there are always bullies just a step behind to tear down his spirit. His dad included. Never accepting the fact that not everyone is athletic. Being talked into accepting his talent gives him the confidence he needs to not only grow as a person, but to have a better relationship with his family. Garvey's Choice is an amazing book and it is one my all time favorite Maine Student Book Awards. Some of the decisions Garvey makes is spectactular considering his dad is always trying to change Garvey's choices and trying to force him to do stuff Garvey isn't interested in. I give this book a four star. This was a good book. The character Garvey was conflicted with a decision that was effected because of the people around him, mainly his family. It was an EXTREMELY quick read so it was hard to do journal work on but it was still a fun book to read. I recommend this to anyone who likes a good realistic fiction book. So many life lessons packed into this incredible novel! The entire book was written in Tanka, an ancient Japanese poetry form, which has 5 lines and a certain amount of syllables per line. I loved the book and then loved it even more when I read this at the back of the book. Another one I can't wait to recommend to the kiddos. Ok, I'm seriously impressed. Yes it's Nikki Grimes, so the bar is high, but she soared over it. It's a very short book with very short poems to tell a surprisingly detailed story with a very strong heart. “Is there more to me? Choose the name you answer to.